It has been one year since LISC Chicago launched the Southwest Corridor Collaborative (SWCC) with Mayor Emanuel, the City of Chicago and our community partners. In that time, LISC and our lead community partners – Greater Auburn Gresham Development Corporation, Southwest Organizing Project and Teamwork Englewood – have stretched ourselves into new areas and expanded our shared understanding and vision for neighborhood economic development. Goal: Attract employers at key locations that can spearhead further investment and net 750 new living wage jobs over the next three-years. The key strategy for this is planning, marketing and driving investment to three key locations: 62nd & Western (Chicago Lawn); 63rd & Halsted (Englewood); and, 79th & Vincennes (Auburn Gresham). Goal: Support residents to build skills and connect to job opportunities. Over three-years, 3,000 unemployed and underemployed residents will enter the job market or increase wages. In the sub-region, the need for employment is significant, over 25,000 people would need to become employed to match the citywide employment percentage. A key strategy for this is coordinating local workforce development providers to collaborate on initiatives and outcomes as well as identifying more resources for the work. Goal: Ownership creates power and wealth, so we are focused on developing a pipeline of small businesses/entrepreneurs for growth and investment. Over three-years, 200 small businesses will receive technical support and/or access to capital. A key strategy here is to identify opportunities to establish ownership as a culture within the community in addition to investing in one small business at a time. So, we are also investing in business concepts that include employee ownership, ownership conversion to minority investors and other concepts that could be scaled or replicated elsewhere. We aren’t waiting for ink to dry on plans, though! I am pleased to report that LISC has already invested nearly $5M in grants and loans in the Southwest Corridor supporting key projects that will help jumpstart investment. These investments have included a variety of projects and partners including seed funding for the Greater Auburn Gresham’s Healthy Lifestyles Hub at 839 W. 79th Street; grant support for the Southwest Organizing Projects’ Reclaiming Southwest Chicago Campaign which is stabilizing families and returning foreclosed single and multi-family properties back to the market; investment in POAH’s targeted economic development and housing projects at 63rd & Cottage Grove; and investing in small businesses including Garifuna Flava, a Belizean restaurant at 2518 W. 63rd Street and E.G. Woode a social economic company whose mission is to stabilize underdeveloped communities and stimulate economic growth by collectively organizing entrepreneurs and business owners to restore commercial and retail corridors. LISC is not the only investor committed to this vision. The City has invested $1M through new neighborhood investments tools including the Neighborhood Opportunity Fund and the Retail Thrive Zones. 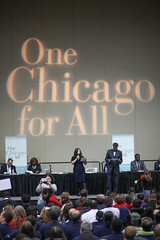 SWCC has also been supported by an investment of $3.5M from Benefit Chicago, a collaboration created by The Chicago Community Trust, the John D. and Catherine T. MacArthur Foundation and Calvert Impact Capital to expand economic opportunity in the Chicago area and strengthen its communities. Many thanks to all of our partners who are supporting this work including the City of Chicago, Alderman Toni Foulkes, Alderman David Moore, Alderman Roderick Sawyer, Chicago Cares, Comcast, Cook County Land Bank, Chicago Cook Workforce Partnership, Community Investment Corporation, LISC Chicago Local Advisory Board, Polk Bros. Foundation and Peoples Gas. LISC is excited about the potential for SWCC and expanding our neighborhood-led economic development approach to more areas of Chicago in the future. We welcome your engagement and partnership and will keep you updated on progress.